Last week, the world’s largest humanitarian prize was awarded to an innovative eye care provider that has saved millions from blindness in India and is now recognized as a low-cost model for efficient healthcare globally. Aravind Eye Care System, the world’s largest eye care provider that has developed innovative technologies allowing it to perform 300,000 eye surgeries each year – 70 percent subsidized or free for the poor – received the $1.5 million Conrad N. Hilton Humanitarian Prize April 20 in in a ceremony in Redwood City. To learn more about Aravind’s model and what the Hilton prize means for the organization, onPhilanthropy interviewed R. D. Thulasiraj, executive director, Lions Aravind Institute of Community Opthamology and director of systems for Aravind. Aravind Eye Care System has been fighting blindness in India for more than 30 years and provides more than 300,000 eye surgeries a year. What does winning the Hilton Humanitarian Award mean to the organization? 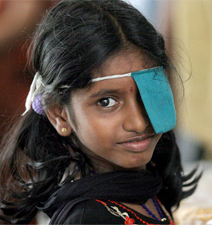 Increasingly, Aravind and its work are becoming known beyond the field of eye care. The recent award from the Conrad Hilton Foundation recognizes the work of Aravind in the much broader context of humanitarian work and social development. Most importantly, it acknowledges not only the work, but how the work has been done in terms of scale, sustainability and being very strongly connected to the community. This recognition opens up a lot of contacts and certainly expands the network of those who can help us further our mission of “Eliminating Needless Blindness” through both resources and opportunities. We know that Hilton’s judging process is quite rigorous and can involve several years of investigation and reporting. Tell us about how that worked and how competitive the prize process was for you. Aravind has been in the running for this prestigious prize for almost 7 years. The scrutiny is very rigorous, and it makes organizations like us reflect on the work that is being done — to bring to surface the strengths and competencies as well as the challenges that are yet to be addressed. Just the process of evaluation itself was an immense learning opportunity for us. And, it helped open us up to other awards, such as the Champalimaud Vision Award in 2007 and the Gates Award for Global Health in 2008. We’ve heard a lot about the Aravind “system” and how it maximizes the number of patients who can be treated at lower costs. How does it work? Aravind’s service delivery model is founded on compassion and a deep commitment to address one form of human suffering – blindness in our community. This led to a series of activities to remove a community’s barriers to getting eye care, such as running outreach activities to overcome access barriers and pricing services to overcome economic barriers. In hindsight, our way of working was based on sound management principles. At the core of it, we have a few processes which make it work well. The first process is one of proactive demand generation, where we really focus on the rural and poor people who are not seeking healthcare anywhere and build trust in those communities. The second process is to insure very high efficiency. In our organization, the ophthalmologist is the most expensive and scarce resource. So, we make sure that the ophthalmologist is at all times gainfully engaged and never employed in activities which could be done by someone else just as well. The third process insures quality. We created a culture within the organization where quality issues are always viewed as process issues rather than something attributable to an individual. We also recognized that it is not only the result of the surgery or diagnosis that affects quality, but equally how these are done. The ambience, the communication, the level of empathy all play a key role in the perception of quality. The last critical aspect is to have a process of continuous improvement that involves everyone in the organization. This not only enhances the work of the organization, but also develops a sense of ownership among the staff. What about the revenue model? How much is fee for service and how much is philanthropy? The financial model is basically that those who can afford it pay a certain fee and become the fee-paying or private patients who pay “market rates” for the services. But the separate wing for the free patients can be accessed by anyone – the patients make the choice. Overall, we have about 60% of the people in the free section and about 40% are in the paid section. The money from the paid patients not only covers the cost of free or subsidized care but also finances the construction of new hospitals, equipment replacement and other capital expenses. The high utilization of all resources makes this possible. We’ve read that so much blindness in the developing world is preventable – why is that so, and how important is it to combat that problem? In the past, there were many preventable eye conditions, such as nutritional blindness due to vitamin A deficiency, or infectious conditions, such as trachoma and river blindness. These conditions are on the decline because of very effective public health measures such as vitamin A supplementation or better hygiene. The bulk of blindness and vision impairment today cannot be prevented; they need to be treated through surgery or glasses or controlled through medication or laser treatment depending on the condition. Any condition which can only be treated or controlled requires building capacity for sustained work. It is much more challenging than, say, eradicating polio where everyone can work together for a period of time and then we are done. Here it is about building capacity for doing it on an on-going basis, until such time that science comes up with a prevention. Finally, what do you plan to do with the Hilton prize money? The primary use of these funds will be to build the capacity of Aravind and develop new models for addressing conditions like pediatric eye care, glaucoma, and diabetic retinopathy. Some of the prize money will be used to fund research so that we start developing a better understanding of how eye diseases occur and delivery issues in the context of developing countries. Another area will be training human resources, which is critical to building capacity.